The Barnes Foundation is known for their collection of impressionist and early modern artwork, including 69 pieces of work by Cézanne. Well, now make that 71. 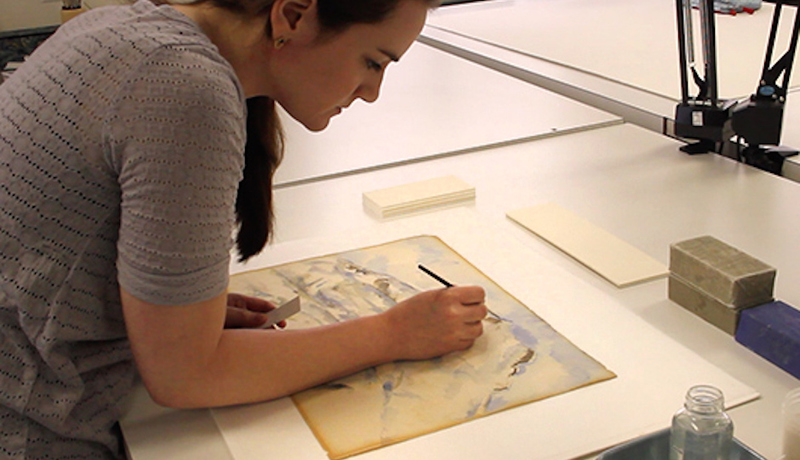 In the process of conserving some of Cézanne’s watercolors, the Barnes Foundation discovered two previously undocumented Cézanne sketches that were covered by brown paper and stashed within the frame. According to Barbara Buckley, the Barnes Foundation’s senior director of conservation and chief painting conservator, “we’ve had [the watercolors] out of frames before. But the backs were covered with brown paper. That’s one of the reasons they were sent [for conservation]. Brown paper is very acidic and they needed acid-free paper.” After the brown paper was taken off the work of Trees (c. 1900), the conservators at the Conservation Center for Art and Historic Artifacts in Philadelphia found a black and white sketch of a house with part of the Toile range that Cézanne frequented while sketching and painting. The conservators also discovered on the back of Chaine de l’Etoile Mountains (c. 1885 or 1886) an unfinished sketching of trees. The piece was laid down by pencil with color added on top. A Barnes spokeswoman states, “as part of our educational mission, we felt it was important for the public to see these.” L’Etoile, Trees, and the two discovered pieces of art will be on a special display for eight weeks in an education room.